Farhad Kia started the final table as the shortest stack, and never got anything going as he busted in ninth place (€4,820) to Joseph Buhmann. Kia moved all in from early position with , and Buhmann was his lone caller from the big blind with . The flop was exciting for both players, as it came down to give Kia the bigger pair. The on the turn was no help to either player, but the on the river made trips for Buhmann as Kia headed to the rail on a tough beat. Jan Hlobil moved all in from under the gun with , and found himself in a race with Runnar Lindepuu in the small blind, who called with . Once again it was an exciting flop ( ), this time making a set in the window Lindepuu to Hlobil's top pair. The complete board ran out as Hlobil picked up €6,360 for his eighth-place finish. Joseph Buhmann bought himself a little time with the elimination of Farhad Kia, but the last of his chips went into the middle before too long. Salvatore Cundari raised from early position, and Buhmann moved all in over the top. Cundari snap-called with pocket aces, and Buhmann was in deep trouble with . The board ran out , and Buhmann was done in seventh place (€8,080). Mark Vos' dominance during the first two days ended on Day 3. On this day, he got it all in with Runnar Lindepuu after Lindepuu three-bet Vos preflop with . Vos moved all in over the top with , and Lindepuu called. Unlike the last pocket eights vs. A-J confrontation, this time the overcards took the pot. The board ran out to give Lindepuu the runner-runner Broadway straight and send Vos home in sixth place (€10,320). Vos had a successful series by any measure, winning Event #2 and cashing in Event #3 on his way to another final table in the Main Event. Salvatore Cundari was the fifth-place finisher, busting at the hands of Marc Naalden when he moved all in over the top of Naalden's raise with . Naalden called with , and when the board ran out queen-high with only one spade, Cundari was done. He picked up €12,900 for his three days' work. After a key double-up, Simon Borg got all his chips in the middle again with on a flop of . Marc Naalden gave him action with , and proceeded to fill up on the turn. The on the river was irrelevant, and Borg exited the event in fourth (€16,340). In what started off looking like an open-and-shut affair, Runnar Lindepuu pushed his short stack into the middle on almost every hand. Finally he got action from Naalden, and he found an early double-up to get himself back into the game. From there it was a see-saw battle that lasted nearly three hours before all the chips went into the middle for the last time. Naalden made a standard preflop raise, and Lindepuu moved all in over the top with . Naalden quickly called with the hand of the day – pocket eights. The eights held up as the board ran out , and Lindepuu was done in second place (€29,940). 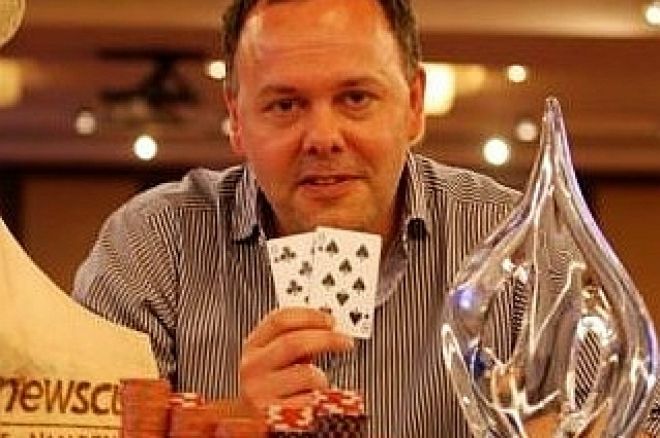 After a tough final table and a ceaseless heads-up match, Marc Naalden finally vanquished Runnar Lindepuu to claim the trophy and the €46,474 top prize at the 2009 PNC Alpine Main Event.